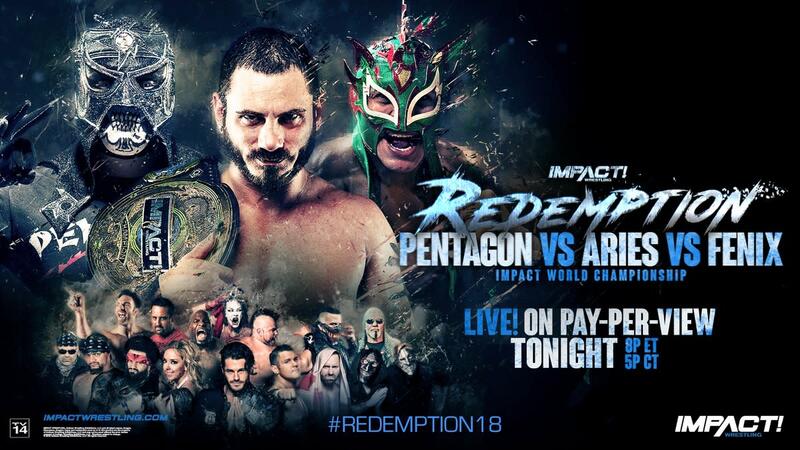 Impact Wrestling presents its first pay-per-view of the current regime tonight as Redemption takes place at the Impact Zone in Orlando, Florida. With Alberto El Patron being released from the company, the main event for Redemption was changed in the weeks before the show. Impact World Champion Austin Aries will now defend his title against Pentagon Jr. and Fenix in a triple threat match. That was also the main event of Impact vs. Lucha Underground in New Orleans, which Pentagon won by pinning Fenix. The Knockouts, X Division, and Tag Team titles will be on the line as well. Allie is defending her title against Su Yung, Petey Williams is challenging for Matt Sydal's championship, and LAX are defending against Eli Drake & Scott Steiner. Eddie Edwards, Moose & Tommy Dreamer vs. Sami Callihan & OVE, Aerostar vs. Drago, Taya Valkyrie vs. Kiera Hogan, and a six-way match are also set for the PPV. Our live coverage begins at 8 p.m. Eastern time. The commentary team tonight is Josh Matthews and Don Callis. Aero Star got the early advantage with a twisting corkscrew body block, hurricanrana and a dive to the floor. Drago nailed a twisting tope con hilo to the floor. Aero Star made a brief comback but Drago regained the advantage and scored another near fall. Aero Star made another comeback by hitting a rolling cutter. Aero Star hit a springboard second rope code breaker for the win. Earlier today, Josh Matthews and Matt Sydal discussed his title defense against Petey Williams later. At the LAX Clubhouse, Santana and Ortiz played a game of Dominos. They pointed out that Konnan is absent. Santana got a phone call and flipped out. Apparently, somebody attacked Konnan. Santana mentioned an individual named King. The heels isolated Ortiz and kept him on their side of the ring. Santana got the hot tag and ran wild. LAX hit a moonsault/leg drop combo for a two count but Steiner broke up the pin attempt. Steiner executed a top rope Frankensteiner on Santana. LAX made a comeback and set up for the Street Sweeper. Instead, Santana hit a cross body block to Steiner on the floor. In the ring, Drake countered and hit the Gravy Train on Ortiz to win the tag team championship. This was a wild match with lots of action and high flying. Fantasma set up for a dive, but Lee cut him off. Lee isolated DJ Z and wore him down. Cage finally got the tag and ran wild. Cage botched a moonsault but recovered and scored a two count. DJ Z leaped off of Xavier’s back and caught Lee with a DDT off the apron to the floor. Cage hit a Samoan drop and fall away slam on Xavier and Fantasma. Finish came when Cage caught Xavier and nailed the Drill Claw for the win. During the match, Tessa Blanchard debuted and joined Matthews and Callis on commentary. Valkyrie and Hogan brawled around ringside to start the match. Valkyrie took over and was firmly in control. Hogan made a brief comeback and scored a near fall. Valkyrie hit the Road To Valhalla for the win. Early in the match, Williams was firmly in control but Sydal took over with a spinning heel kick. Sydal hit a standing moonsault for a near fall. Williams locked on the Sharpshooter by Sydal made the ropes. Williams followed up with a springboard code breaker on the apron. Sydal attempted the Shooting Star press, but Williams got his knees up. Williams hit the Canadian Destroyer but Sydal rolled to the floor. Williams teased doing a super Canadian Destroyer but Sydal countered. Williams attempted another Destroyer but Sydal countered into a pump handle into a pin to retain the title. Jake hit a dive onto all three faces but Moose caught him with a power bomb on the apron. Moose attempted a tope con hilo but Callihan moved and Moose crashed hard on a ladder. OVE took over and used a series of triple team moves on Dreamer. OVE isolated Edwards and hit the All Seeing Eye onto two chairs. Dreamer gave Callihan a Death Valley Driver through a table on the floor. Dave attempted to superplex Edwards into thumbtacks. Moose and Edwards gave Dave a power bomb/Boston knee party onto the tacks. Callihan brought in a baseball bat, but Dreamer brought in a barbwire baseball bat. Callihan nailed Dreamer with a low blow and rolled him up for the win. After the match, Edwards busted Callihan open with the barbwire bat. Edwards tied Callihan to the ropes and viciously beat him with a kendo stick. Edwards snapped and hit the referee, Dave and Jake with the kendo stick. Dreamer tried to stop him but got shoved to the ground. Alisha Edwards ran out to stop him but he accidentally hit her with the kendo stick. Edwards was distraught as medical personal checked on his wife. Sutter distracted Allie, which allowed Yung to gain the early advantage. Allie fought back and took over. Allie climbed up top but Sutter yanked her leg and pulled her off. Allie made a fiery comeback and ran wild. Allie hit the Best Superkick Ever but Sutter jumped on the apron. Allie knocked Sutter off the apron. Yung set up for the Panic Switch but Allie rolled her up to retain the title. After the match, Yung was upset about the loss. Sutter got down on one knee and proposed to Yung. She spit the red mist in his eyes and applied the mandible claw. Slammiversary takes place from The Rebel Complex in Toronto, Canada on July 22, 2018. Aries avoided a double superkick and escaped to the floor. Fenix nailed Aries with a kick and caught Pentagon with a rolling cutter. Fenix threw Aries to the floor but Aries adjusted and caught Pentagon with a hurricanrana. Fenix struggled to hit a twisting corkscrew cross body block to the floor. Aries hit the drop kick in the corner and set up for the 450, but Pentagon shoved Aries to the floor. Pentagon hit a lung blower on Fenix for a close near fall. Fenix fought back and nailed a rolling springboard uppercut in the corner. Pentagon hit the Pentagon Driver but Aries made the save. Aries hit the 450 splash on both guys for a two count. Pentagon and Fenix nailed Aries with a double superkick. Pentagon suckered in Fenix and nailed him with a superkick as well. Pentagon hit a Gory Special and Package piledriver simultaneously on Aries and Fenix. Pentagon snapped Aries's arm and hit the Pentagon Driver to win the Impact World Championship. After the match, Pentagon and Fenix hugged as a shocked Aries watched from afar.